Audi has proved its mettle as a luxury auto manufacturer in its past five-year venture in India. After doing successfully in the luxury sedan and SUV segment, the German automaker plans to shift to mainstream sportscars with the launch of the S4. 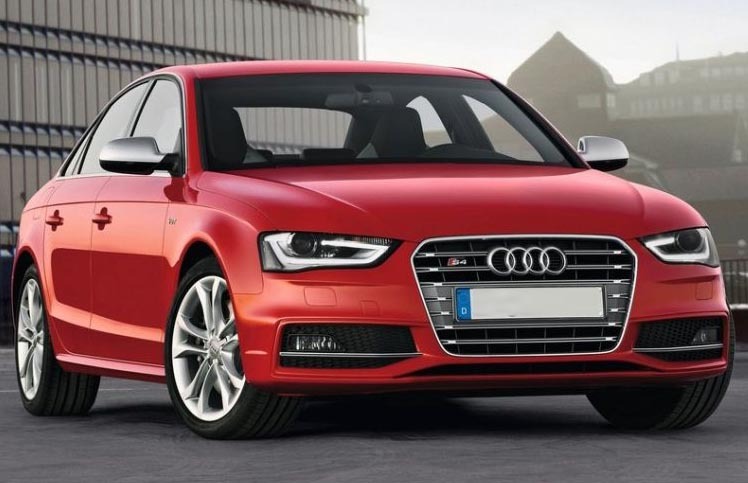 The Audi S4 is a sporty derivative of the A4 sedan, which is also expecting Indian debut soon. The difference creeps in with the beefed body style of the S4, which is sportier in comparison to the A4 sedan. Other differences include the body height, which is also lower by 20 mm with the help of a suspension package in order to augment the sporty guise of the car. Going along with the sporty appeal are the large 18-inch alloys, with low profile rubber that give a sensational appearance to the four-door sporty sedan. However, the Indian buyer may get a trim variant of the sports sedan, to keep the price low. Under the hood, Audi S4 will boast a 3.0-liter 6-cylinder TFSI engine that can pump out as much as 335 bhp power and an enormous 440 Nm peak torque. Mated to the petrol motor is a 7-speed S-tronic transmission that can pull the car from 0-100 kmph speeds in less than 5 seconds. In terms of fuel economy, the S4 is expected to deliver 13 kmpl city mileage. It should not come as a surprise that Audi will feature the S4 sports sedan with Quattro all-wheel-drive technology and top-notch performance, stability, handling, vehicle dynamics and driver controls. Moreover, the German automaker will sport high performance braking system in the S4, to control all the horses growling under its hood. Audi already has the R8, TT and RS5 in its Indian portfolio, and the arrival of Audi S4 will carve an entirely new segment of high-performance, practical cars in Indian market. If things fall in right place, we could see the entire range of Audi S models coming to India.